Larry David ("Curb Your Enthusiasm") wrote and stars in his first play. Women love a self-confident bald man. The debut play by the writer of "Seinfeld" and "Curb Your Enthusiasm" deals with the aftermath of a death in the family. Really enjoyed the show. Funny actors. Great job. We are not Broadway regulars but are fans of many in the cast. LD, RW and RP all were very entertaining. Well done. We wish them the best of luck w the show. I recommend to anyone who would like an enjoyable night at the theatre. Larry David at his best! This IS quentisential LD - so if you love Curb and Seinfeld this is THE Broadway show to see. 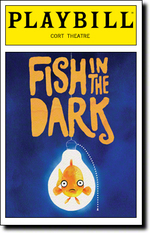 I am not a giant fan of Broadway shows and am usually disappointed but Fish in The Dark exceeded my expectations with sets that paid attention to detail and a cast that was exceptional. I laughed the entire show as did the whole audience. The only negative was a scene from one of Larry's shows- right before the Curtain went up a giant man appeared out of nowhere with an equally giant Jamba Juice - he threw himself into the seat next to me spilling over into my seat and then proceeded to noisily slurp on his frozen concoction the entire first half! It was unbelievable . Hopefully this gentleman will not be at future shows ! I saw the play on February 4th and absolutely loved it. My husband and I laughed through the whole thing. Larry is Larry, and that's why we love him. All the actors were great, but I felt the actress playing Larry's Mom stole the show. The only negative was the theater was astonishingly hot. I had sweat pouring off of me. Saw the play on Wednesday, Feb. 4 with wife and two friends. Disappointing. First, the actors did not use microphones. My hearing is excellent and even I had a difficult time hearing the dialogue. Second, the theatre was so hot. No temperature control. At intermission I asked if they had hearing devices and used one for the second half---much better. The play was an extended episode of Curb Your Enthusiasm and while I love Curb, this was not one of Larry David's best. Jokes seemed old and tired. Just seemed to be like a high school play. Pacing was erratic and just didn't build up to a crescendo. Lacked energy. Larry was his usual self but appeared out of his element. Maybe there is a reason that the billboard outside stated that this was his first play since the 8th grade. It felt that he was trying too hard. There seemed to be a lack of connection to the audience. I hope the ensemble will do some tweaking before it officially opens in March. Wish it was a more enjoyable experience. If one desires a good laugh around a family of usual suspects this is the play to see.... great stage sets and funny one liners == mother is a rip.. see it or be "a person in the dark"